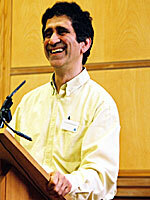 Farhad Khosrokhavar is a professor at Ecole des Hautes Etudes en Science Sociales in Paris. He was born in Iran and from 1977-1979 was Assistant Professor in Bou Ali University, Hamadan, Iran. From 1979-1990 he was Associate Professor at the Center for Science Policy, Ministry of Culture and Higher Education, Iran, and from 1990-91 was Rockefeller Fellow. In 1991 he became an Associate Professor at EHESS-Cadis, becoming a full professor in 1998.His publications include Les nouveaux martyrs d'Allah, Flammarion, 2002; L'instance du sacré: essai de fondation des science sociales, Cerf, 2001; (with Alain Touraine) La recherche de soi, Fayard, Paris, 2000; (with Olivier Roy) L'Iran: comment sortir d'une révolution religieuse?, Seuil, 1999.